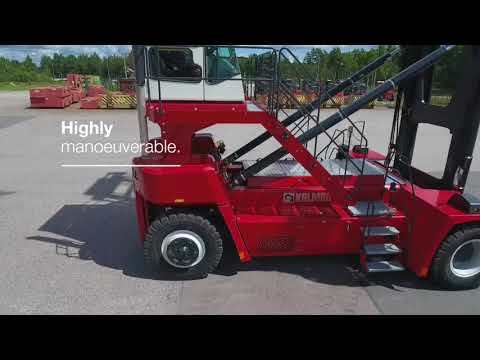 Built on our tested and proven G-Generation platform our new Essential Range of 8-10 ton empty container handlers will deliver everything you expect from Kalmar, for a great price. There are three different machines available, with different lifting capacities from 8-10 tons. With a range of highly efficient driveline combinations to choose from, you can expect to use less fuel and produce less emissions. Up to 10% less. Our Essential Range is built on our proven and tested G-Generation platform and the experience of building over 10,000 reachstackers. 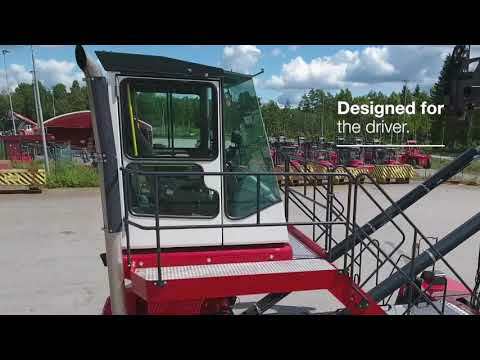 Your drivers will benefit from common electronics, controls and diagnostics across the entire range, for ease of operation. With easily accessible service points and extended servicing periods, maintenance tasks will be quicker and easier to perform, increasing your machine availability. Our new Essential Cabin has been ergonomically designed so everything is in easy reach for your drivers. You get a choice of joysticks that will increase operational safety and control, as all movements are managed from one point. You can have the cabin mounted in one position or mounted on rails so it can be moved hydraulically while in operation. The safety of your drivers is extremely important, which is why we have more safety features as standard than our competitors. You can also enhance your employees' safety further by fitting a Rear Mounted Camera, additional LED lights or a Speed Limiter. Our Essential Range of empty container handlers can be fitted with heavy duty steering axles, drive axles and lifting chains if you need to operate in tough conditions. Our heavy duty axles will improve machine stability when lifting to the top of the stack, making it safer for your driver and bystanders. All of our empty container handler masts can be tilted both forwards and backwards by up to +/- 3 degrees. Tilting backwards helps stabilise your load while moving and makes it easier to lift a container off the stack. Being able to tilt forwards will make placing a container either on the stack or on a trailer much easier and safer. There are optional tilting packages available with different tilting angles. 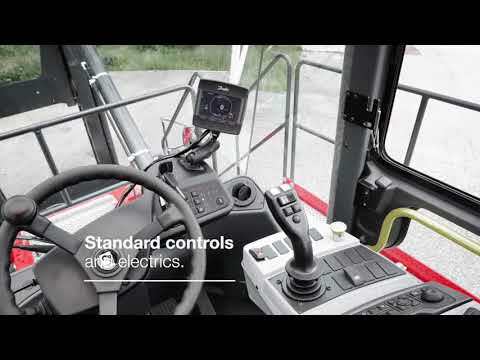 By combining the latest generation of highly efficient engines with the improved DANA TE 14300 3+3 transmission you get a choice of drivelines that will reduce fuel consumption by up to 10%, without reducing available power. Engines are available in Tier 3 or Tier 4F emission compliant. Our Essential Range of empty container handlers are all fitted with a load sensing hydraulic system, which applies the right amount of power to get the job done efficiently by measuring the exact weight of the container being handled. Should you require any additional power to get a specific job done quicker, you can use our power on demand system. This system tells the engine to produce additional power at the touch of a button. With industry leading service intervals, easily and safely accessible servicing points, your team can complete maintenance task faster and safer. Saving you time and money. The Essential Cabin has been ergonomically designed to improve both your driver's comfort and operational control. With an adjustable steering wheel and seat, control levers as standard or the choice of two optional joysticks everything is always within easy reach for your driver. Our new Essential cabin benefits from a new climate control package. This system has extra strong fans, so condensation can be removed quickly and a comfortable operating environment maintained for your drivers. There are many benefits to a standardised platform. You get a common control panel across the range, common electrics with common error codes, common points of connection and increased availability of common parts. Making operating your machine easier. Non-slip surfaces, three-point access and two exit doors in case of an emergency, are just a few of our standard safety features. You get LED lights as standard, an electrically operated hand brake that is automatically applied when the engine stops, and an overload management system that warns your driver should they exceed the specified limits. Our new machines are smarter than before as they have a greater capacity to share data with external sources. 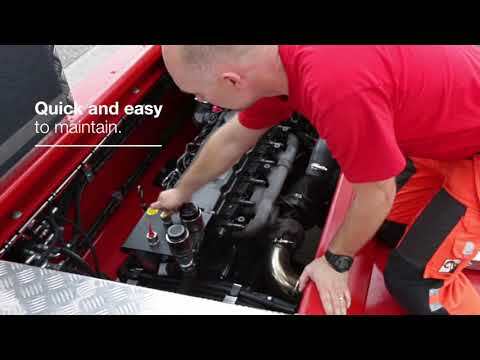 You can connect to your machine with Kalmar SmartFleet, where you can monitor and optimise your machine's performance, or other external systems.